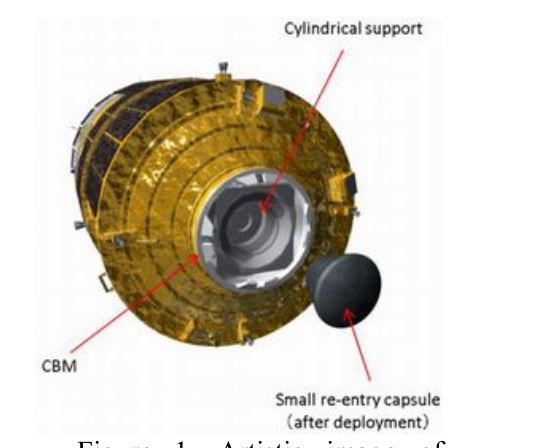 How does the HTV Small Return Capsule get used? The HTV Small Return Capsule (HSRC) is on the HTV-7 mission to the ISS. It is a sample return, small capsule, shaped as you would expect, like a small Apollo/Orion/Dragon shape. It is shipped up inside the HTV in the pressurized section. Assembled by the ISS crew, reattached somehow to the HTV. Then when the HTV is released from the station's CBM port, released by the CanadArm2 to orbit independantly it is then somehow released from the HTV. The question is, without an EVA the only portion of the HTV available is the hatch door, which mates pretty closely with the CBM internal hatch. I.e. The HTV hatch that faces vacuum and the ISS hatch that faces vacuum are the parts that face each other when it is first berthed. Then the ISS door is opened, and finally the HTV door is opened. Is there enough room in that gap for the HSRC? If so, it seems like it must be pretty small. If not, where is the HSRC actually attached? It mounts on the hatch/CBM interface. Not the answer you're looking for? Browse other questions tagged iss jaxa return htv or ask your own question. How much payload, could a Soyuz return, without crew? How will Akatsuki get into orbit around Venus? At what point in the atmosphere does a returning space object adopt the rotational speed of planet earth and how?